Sophomore forward Edward Kizza takes a shot on goal during Pitt’s 3-4 loss to Cleveland State Monday night. 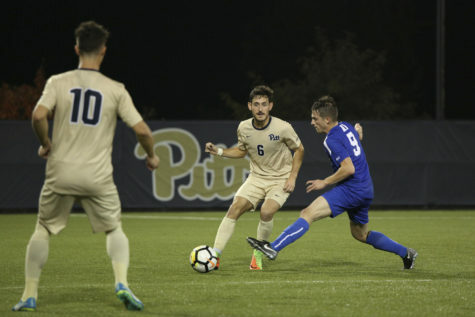 In a back-and-forth game that saw three ties and four lead changes, the Pitt men’s soccer team was beaten by Cleveland State 4-3. 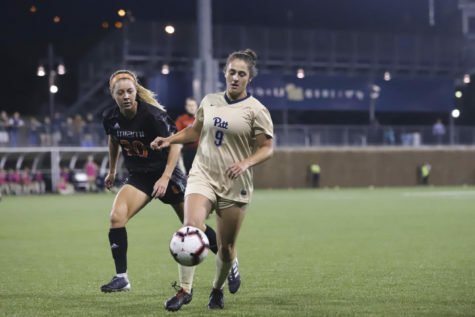 The Panthers (6-6) had many chances to win the game and tie at the end, even when they went down to 10 men in the 34th minute, but couldn’t find the goal to save the game against the Vikings (4-5-1). The first half started off quickly for both teams as the pressure was on from five minutes in. 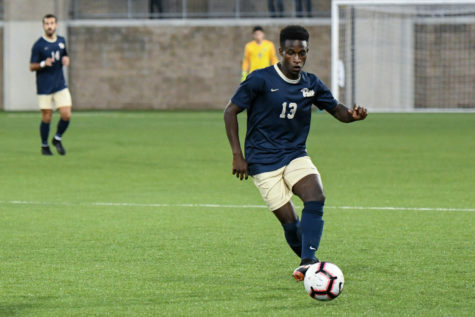 Junior forward Gabriel Pewu of Cleveland State almost had a brilliant chance to score in the sixth minute after senior defender Peter Prescott for Pitt lost the ball, but Prescott hustled back to shut an easy path to the goal for him and ended up blocking his shot. Senior midfielder Noah Pio got the rebound and drove left, but his shot was a simple catch for first-year goalkeeper Johan Penaranda. The first scoring chance for the Panthers in the game led to a great goal. Sophomore defender Jose Luis Sena Arbona cut out the Vikings pass and delivered a great overhead through ball to sophomore forward Edward Kizza, who chipped the goalkeeper, redshirt freshman Alex Gyerman, from outside the box to put the Panthers in the lead in the ninth minute. 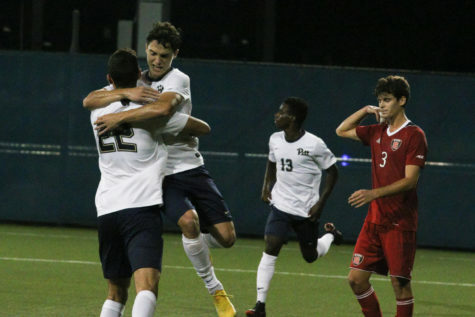 A close chance in the 14th minute almost resulted in Pitt taking a two-goal lead after a bad back pass from Cleveland State sophomore defender Thomas M’Barek. But Gyerman came out this time and was successful, sending the ball across the field before Kizza could get to it. 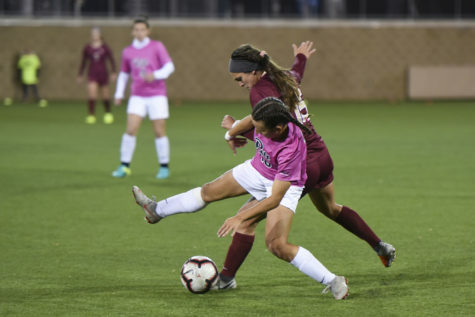 The Panthers missed several chances at goals while the Vikings were able to run down the field and equalize. Pio sent a ball to Pewu, who was able to run down with it to the edge of the goal. He then attempted to pass to midfielder Zack Kleuver, but the pass was blocked and the ball bounced around the box for a few seconds. Kluever managed to get up from the ground, go around Penaranda and put it in the right corner to make it 1-1. 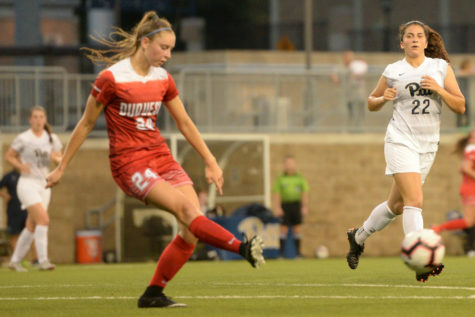 The Panthers finally responded in the 27th minute with a second goal to retake the lead. Senior defender Tom Moxham delivered a great cross that led to an even better header by Kizza, which gave Gyerman no chance to save it. 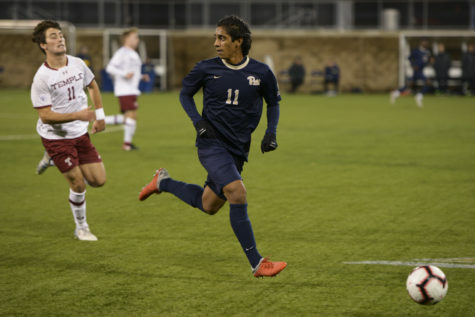 A free kick by senior midfielder Javi Perez in the 30th minute almost gave Pitt a third goal, but it ended up going wide right. While the Panthers were up 2-1 and starting to get on a roll, a red card to Prescott sent them down to 10 men in just the 34th minute. Prescott was shown a red after clipping the legs of Pewu and bringing him down, and because Prescott was the last defender before the goalkeeper, the card was solidified. Less than a minute after a free kick from Cleveland State that ended in Penaranda’s hands, there looked to be a handling incident in the Vikings’ penalty box after a backward pass hit M’Barek’s hand, but the referee gave it no attention. The last chance in the half for either team was from the Panthers. Perez and Sena Arbona connected in the 39th minute on a cross, but Sena Arbona sent it way high over the goal. The second half started quickly as only five minutes in, a penalty kick was given to the Vikings after Moxham handballed a shot from junior midfielder/defender Vlad Jandric. Pio stepped up to take the penalty, but he sent it way over the goal, not testing Penaranda whatsoever. Kizza had a chance for the hat trick in the 50th minute, but he couldn’t slide it past the goalkeeper with his left foot, so his shot ended up going wide left. 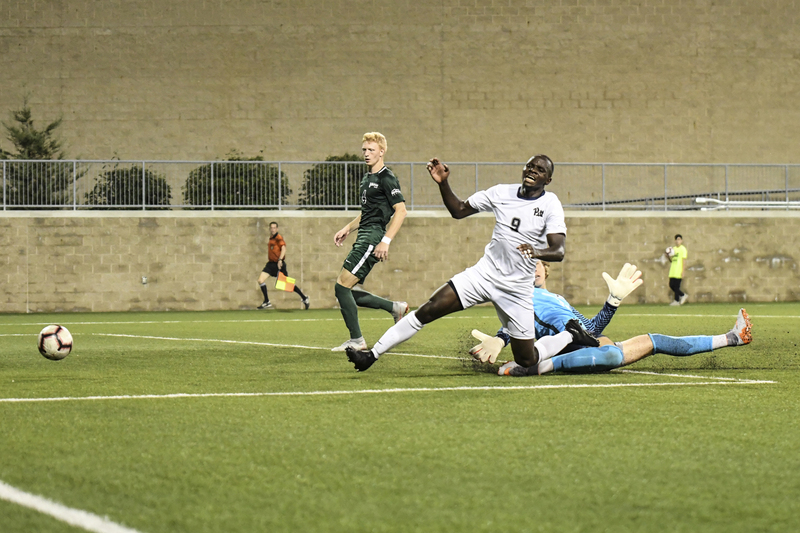 First-year midfielder Jackson Walti sent a power-driving shot in the 54th minute from outside the box off bad clearance that was impressively saved by Gyerman, who stretched out and stopped it with his right hand. The Vikings finally leveled in the 67th minute after Jandric sent a cross in from outside the box to senior midfielder/defender Antonio Burgoa, who headed it in over Penaranda. Despite being level, the Panthers kept attacking for the rest of the night. Perez delivered a great ground through pass to sophomore midfielder Marcony Pimentel, who had his shot deflected wide for a corner in the 71st minute. In the 73rd minute, redshirt senior defender Robby Dambrot took a long shot from outside that Gyerman had to punch over for a corner. Perez and Dambrot both continued to attempt shots, but were unsuccessful in their attempts. 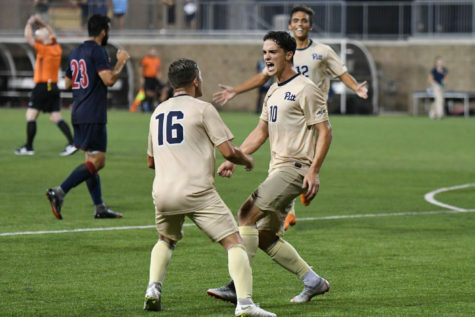 Although Pitt fought hard to take the lead, Cleveland State ended up in the lead in the 77th minute after defender Ryan Kolonick sent in a good cross to Pewu. Pewu then headed it in the back of the net before Penaranda could punch it out, making the score 3-2. But the Panthers’ hard work on offense soon paid off as they scored quickly after conceding. Dambrot put in a great cross to Kizza, who once again headed it in for his third goal and a hat trick to make it 3-3 in the 80th minute. While Pitt thought they could go for the win or at least take it to overtime, Cleveland State had other plans and once again took the lead. After redshirt senior defender Shane Wiedt did a brilliant job to stop first year midfielder Tommy Paltani from scoring, the Vikings were given a corner. In the 85th minute, the corner taken by Pio found sophomore defender Ben Hryszko, who headed it in the back of the net to make it 4-3. 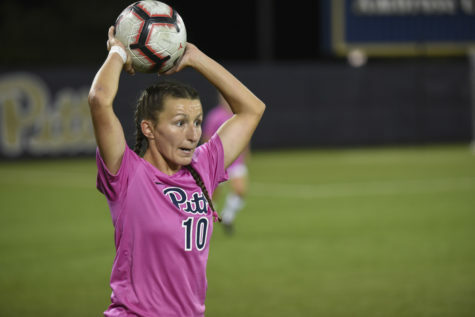 Pitt had one last chance in the game to tie it and that came from a great cross by first-year defender Nyk Sessock. He put it perfectly for Dambrot, but it deflected off of Kizza for a goal kick. 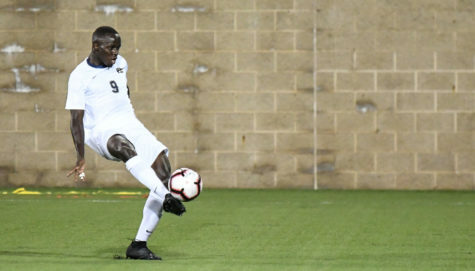 While Kizza had a successful game scoring a hat trick and also a great game last time out scoring two in the 2-1 win over conference opponent Clemson, he couldn’t be happier with the way the game ended and was more focused on how to correct the mistakes that were made in the loss. The Panthers have finished their five game home stand and will travel to face ACC opponent, Virginia Tech, Friday at 5 p.m. in Blacksburg.